It’s hard to take a good picture of this delicious recipe from the Les Halles cookbook by Anthony Bourdain, but we recommend cooking it for its eating purposes alone. Season the chicken all over with the salt, pepper, and cayenne. Heat a large pot over medium-high heat and add the oil. When the oil gets hot, add the butter. Once the butter has foamed and subsided, add the chicken, skin side down, and brown on that side only. Remove the chicken with tongs and set aside on a plate. Add the peppers and the onion to the pot and reduce the heat to medium low. Cook for about ten minutes before adding the tomatoes. Now cook until the liquid is reduced by half. Stir in the wine, scraping the bottom of the pan with a wooden spoon to get up all of the goodness. Cook until the wine is reduced by half, then add the water and the bouillon cube. Return the chicken to the pot, making sure to also add all of the juices from the plate where it’s been resting. Cover the pot and allow to cook on low for about 25 minutes. Remove the chicken to the serving platter. Once the chicken is removed, increase to high heat and reduce the sauce for five minutes. Season with salt and pepper and add the parsley. 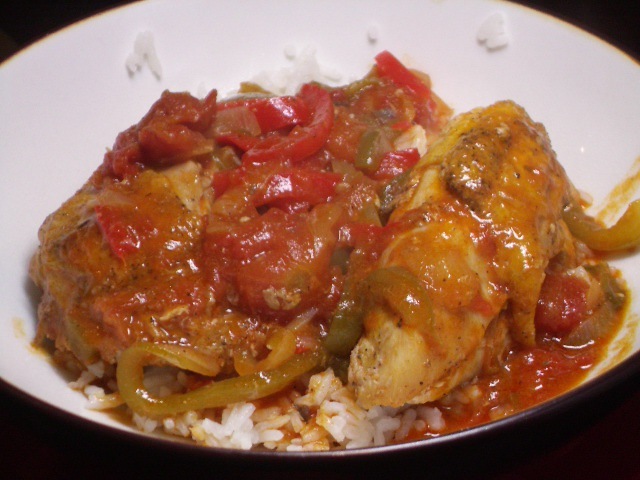 Pour the sauce over the chicken and serve immediately with the rice. ENJOY! FUN VARIATION FOR TWO: Instead of 4 pound chicken, use a 1.5-2 pound cornish game hen, and cut all of the other ingredients in half. This is how we made the recipe, and it was delicious and perfect for two people (with some lunch leftover the next day).